Isn’t she purty? And she isn’t even blocked yet. That’s MMario’s QAL. You can get the pattern by joining MMario’s Yahoo! Groups list MMarioKKnits where you can see a photograph of a QAL all stretched out for blocking. I used Jaggerspun Superfine Merino lace weight yarn in jade (Mmmmm! Yummy yarn!) and US#8 Knit Picks Harmony circular needles. Boy, do I ever like those Harmony needles. But MMario’s design is the real star. QAL is one of the most enjoyable patterns I have ever knitted. It’s easy, but never boring. And the final result is spectacular, even unblocked. 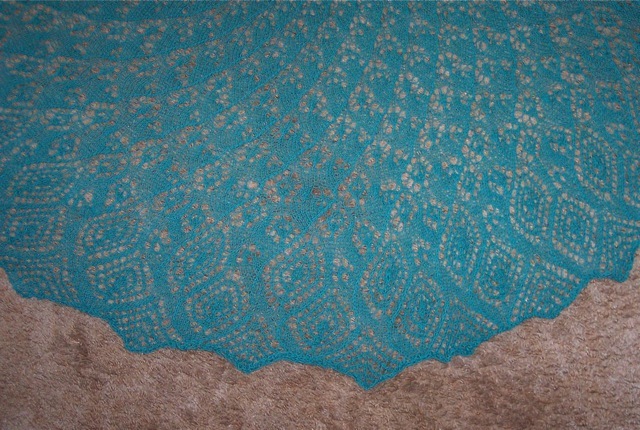 Here are more pictures of my unblocked Queen Anne’s Lace Shawl. It took me exactly one month to knit QAL. Had she been my only project, I probably could have completed her in just a couple of weeks. But you know me; I have knitter’s ADD. I absolutely have to have more than one project to work on at a time. I sometimes envy those knitters who are so single minded that they finish each project before starting the next. Not me. I cannot resist casting on project after project. There are many knitters like me who have multiple projects in progress at all times. Some knitters get in way over their heads and have so many projects going at once that some of them kind of get lost in the shuffle. 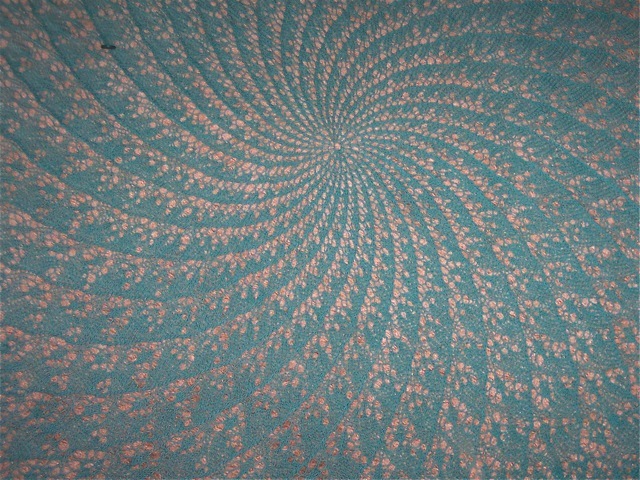 The knitter will come across a half-finished item at the bottom of the knitting bag and have a Homer Simpson moment—Doh! I forgot all about that sweater, shawl, scarf, sock, hat, mitt, whatever. One of the biggest temptations for knitters is the “Mystery” KAL. 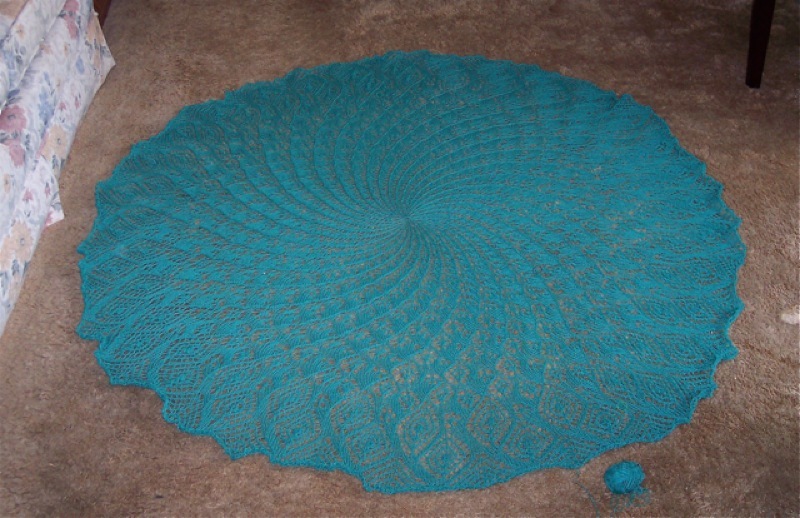 For those who don’t know, this is a cyber-knit-along where, say, a shawl pattern is given in parts, usually a new part each week, and the knitters don’t know what the finished item will look like. That’s the “mystery” in a Mystery KAL. I’ve done three mystery shawl KALs myself. The first two were very nice, but the third was not so great. The design was sloppy and the pattern poorly written. But it was free, so I don’t have any complaints. Free KALs tend to attract large numbers of participants. There are some knitters who just cannot seem to pass up a free pattern. Then they find themselves with too many projects and too little time. I learned my lesson with mystery shawl number three. No more mystery KALs for me. I’ll stick to knitting shawls that I know I love. I see more MMario designs in my future.